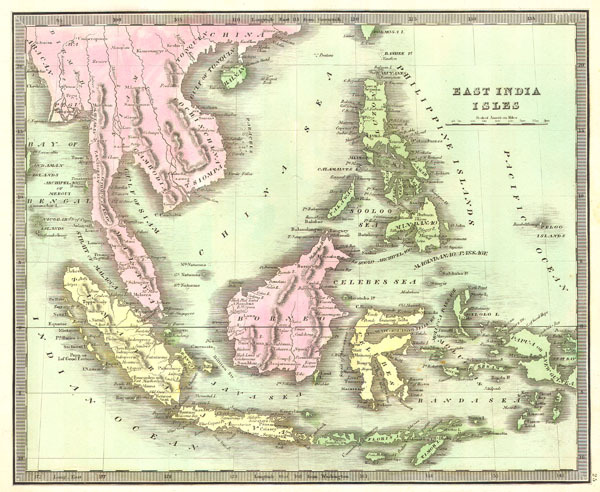 This hand colored map is a lithographic engraving of the East Indies, dating to 1842. Depicts all of Southeast Asia and the East Indies including Sumatra, Java, Borneo and the Philippines. On the mainland it shows the Kingdoms of Siam (Thailand), Tonquin (Vietnam), Malaya, and Cambodia. Also depicts the island city of Singapore. Like most Greenleaf maps, this is undated. Jeremiah Greenleaf (1791-1864) is a little known but highly admired American cartographer of the early 19th century. He published from roughly 1830 to 1850. His most important work, A New Universal Atlas; Comprising of all the Principal Empires, Kingdoms, & States Throughout the World and Forming a distinct Atlas of the United States. Many of his maps are reformatted versions of his contemporary David Burr's much admired cartographic works. Greenleaf's maps are extremely rare and admired for their stunningly vivid pastel color washes.